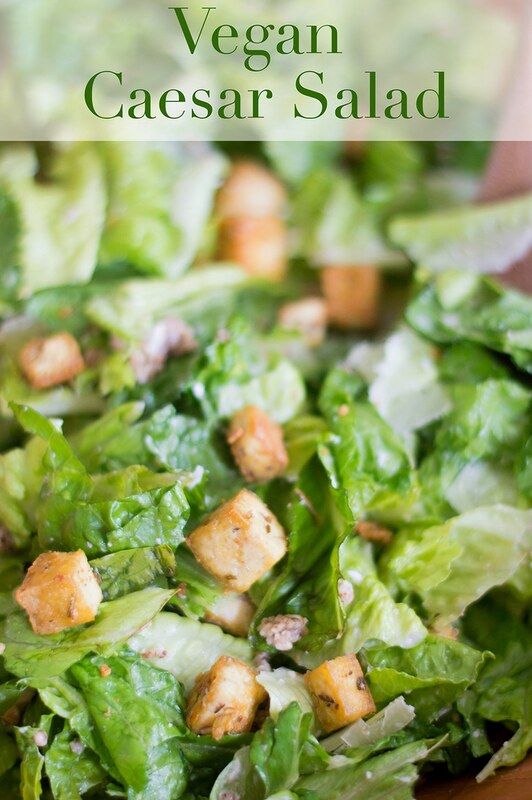 Quick and easy vegan Caesar salad recipe. 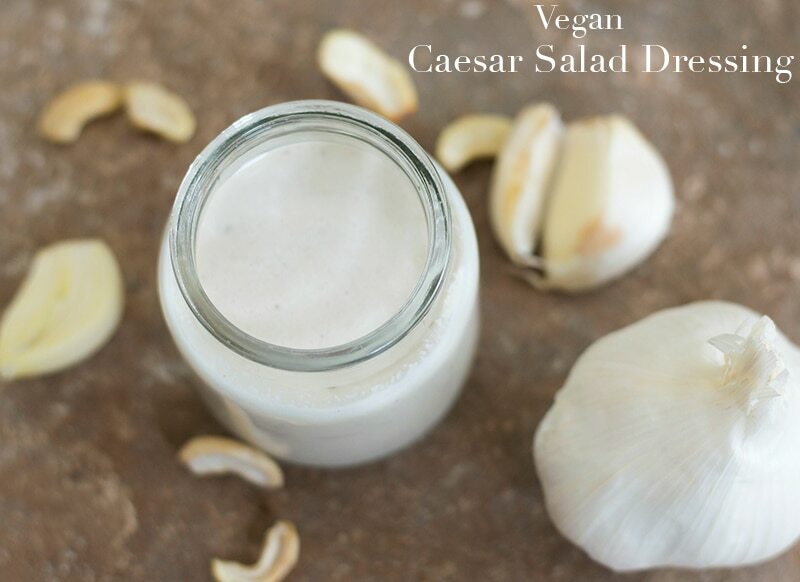 Vegan Caesar Salad dressing is made with cashews and coconut. There is Homemade Vegan Parmesan Cheese in it and Lightly Stir-Fried Tofu in place of Croutons. Once in a while, I like a dressing made with a comfortable dose of garlic! This is one of those vegan salad dressings that will open up your sinuses and awaken your taste buds. 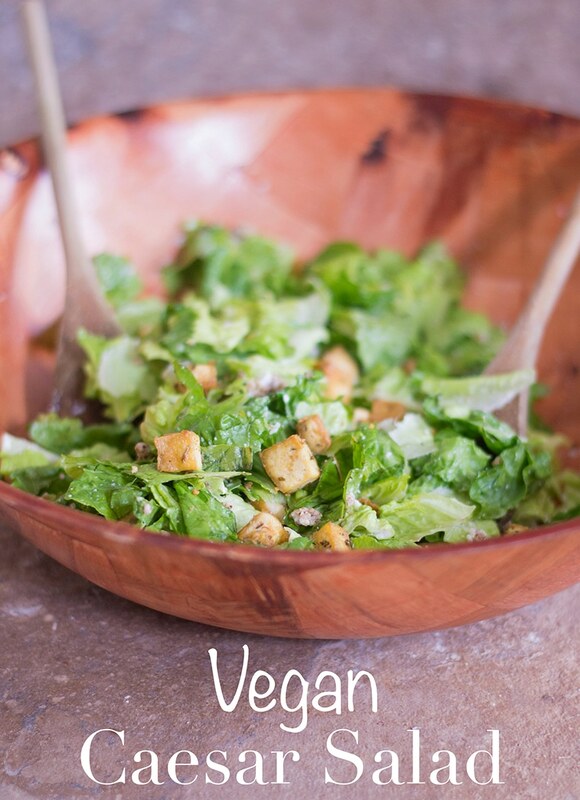 Are those croutons in the vegan Caesar salad photo? If you said yes, you would be so wrong! Sorry, I just had to rub that in! 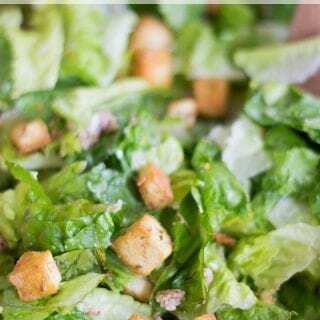 If you are like me and don’t like croutons in your salad, I have something you just may like! Those are not croutons! It is actually quickly stir-fried tofu that ended up looking like croutons. It was completely by accident and a very happy surprise. It makes me so happy to see tofu look so appealing and delicious! I cut the tofu into cubes and put it in a wok with heated olive oil. I added rosemary, oregano and salt to it and stir fried it for about 7 minutes on medium heat. When I took it off the heat, this is what it looked like! The challenging part of any vegan recipe for me is the cheese! I find it so hard to use store-bought vegan cheeses, so, I experiment with making my own. My vegan feta cheese recipe has been my favorite cheese experiment of all time. It comes very close in flavor to the real thing. The “Parmesan” in this recipe is actually a mix of cashews, almonds and pecans. I ground them in a mini processor and then sprinkled them on this salad. It turned out delicious, if I say so myself. The other challenging part for this recipe was the Caesar salad dressing. Instead of the eggs, I put cashews that were soaked overnight. There is garlic, agave, shredded coconut, oil, salt and water. Oh my gosh! I cannot tell you how amazing it tasted. This salad recipe is right on par with my sweet kale salad recipe. Honestly, I can’t pick my favorite. They are both easy to make and healthy. Luckily, I don’t have to choose a favorite. If there was a bowl of each in front of me, I would devour them both. What is your favorite way to cook tofu? Gently add the tofu and stir fry for 7-10 minutes. Roughly tear romaine lettuce and add it to a salad bowl. Add half of the salad dressing and toss using wooden spoons.